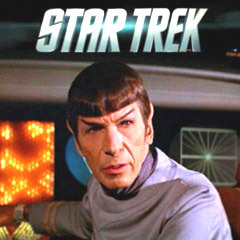 The film opened in the year 2285 with a training session at Starfleet Academy directed by Admiral Kirk (William Shatner); the USS Enterprise was being commanded by eager female cadet half-Vulcan Lieutenant Saavik (Kirstie Alley), one of Captain Spock's (Leonard Nimoy) protege trainees in a scenario called Kobayashi Maru - a no-win situation to test a potential commander's character and abilities in a life-death situation [Note: It took Kirk three tries to beat the simulation, after reprogramming it to allow him to win]; in the simulation, the starship was on a rescue mission in the Neutral Zone of damaged Altair VI (a neutronic fuel carrier that had struck a gravitic mine and suffered casualties) when it was attacked by three alien Klingon cruisers with torpedoes, leaving every crew member playing dead on the bridge, including Spock (a foreshadowing!). Meanwhile, Russian-accented Officer Pavel Chekov (Walter Koenig) was on a mission on the starship USS Reliant, captained by Clark Terrell (Paul Winfield), to Ceti Alpha VI in connection with the top-secret Federation Project Genesis, still on a search for a lifeless planet to use as a test site for the Genesis Experiment. On the space station laboratory Regula I, scientist Dr. Carol Marcus (Bibi Besch) headed up Project Genesis, a computer-simulated endeavor that sought to transform uninhabitable worlds into lush paradises ("life from lifelessness"), with her son Dr. David Marcus (Merritt Butrick), Kirk's progeny from a previous relationship; the Genesis Device was a torpedo that reorganized molecules at the subatomic level to create worlds for colonization - a weapon that could do both harm or good ("could be perverted into a dreadful weapon"). Chekov and Terrell were beamed down to the inhospitable surface of Ceti Alpha VI (they didn't know they had actually landed on Ceti Alpha V) to check for signs of life, where they were confronted by genetically-engineered, bare-chested superhuman Khan Noonien Singh (Ricardo Montalban) of the late 20th century [Khan once was a powerful ruler over SE Asia on Earth that threatened the Enterprise, but was defeated and escaped in a cryogenic sleeper ship - it was found adrift in space by Kirk]; they learned that Captain Kirk had exiled Khan to the planet 15 years earlier; the vengeful Khan, sounding like Shakespeare's King Lear, led a group of survivors - the crew of the SS Botany Bay, marooned on Ceti Alpha V on the "barren sand heap" (the wasteland was caused by an explosion on Ceti Alpha VI that shifted the planet's orbit and its ecosystem - "everything was laid waste"); Khan blamed Kirk for the death of his beloved wife due to a parasitic, insanity-causing Ceti eel, which he also implanted into the ears of Chekov and Terrell to control their minds. Lieut. Saavik piloted the Enterprise with a training crew out of its space drydock for a routine training voyage; the starship Reliant, now commandeered by Khan, communicated with an infuriated Dr. Marcus on Regula I, and ordered her to give up all her materials related to Project Genesis months earlier than planned for use on Ceti Alpha VI (mind-controlled Chekov claimed it was Admiral Kirk's order); when Kirk was notified with a garbled message, he changed course toward Regula I to investigate Marcus' complaint; the Enterprise was ambushed and fired upon (with the deaths and injuries of some young cadets), and Khan was revealed to be in command (with right-hand man Joachim (Judson Scott)), demanding the Genesis Project materials. With knowledge of how to lower the Reliant's defensive shields to enable a counter-attack, Kirk was brilliantly able to cause the starship to withdraw temporarily; the Enterprise proceeded to Regula I, where it found most crewmembers dead after being tortured by Khan, although Dr. Carol and David Marcus had escaped to Regula; after transporter-beaming down to the "great rock in space" - the Class D planetoid Regula, it was revealed that Chekov and Terrell were still being used as Khan's spies to successfully acquire the Genesis torpedo Device, but when ordered to kill Kirk, Terrell turned his phaser gun on himself, while the eel controlling the resistant Chekov exited from his ear and was destroyed. David was revealed to be Kirk's son through Carol from a previous relationship ("My son. My life that could have been and wasn't. How do I feel? Old, worn-out"); Khan departed from Regula when he believed that Kirk was stranded there, but he had been fooled; Carol suggested to Kirk: "Let me show you something that will make you feel young as when the world was new" - and showed an impressed Kirk the underground Genesis cave and its beautiful biosystem, evidence of the Genesis Effect, before they were beamed back onto the weakened Enterprise - still under the threat of Khan; the crippled Enterprise retreated to the static-filled atmosphere of Mutara Nebula where "the odds will be even" and defensive shields useless. The battle ended with the Reliant fatally disabled, the death of Joachim, and mortally-wounded Khan setting the Genesis torpedo to detonate within four minutes ("To the last, I will grapple with thee...For hate's sake, I spit my last breath at thee"); doomed without warp power, Spock transferred his katra -- his memories and experience -- to Dr. Leonard "Bones" McCoy (DeForest Kelley) with the word "Remember" and then decided to sacrifice himself by entering the starship's radiation chamber to repair the Enterprise's warp drive; he died a heroic, self-sacrificial death from radiation poisoning, next to his friend Kirk. When the Genesis torpedo exploded (destroying the Reliant and Khan), the Enterprise went into warp speed and escaped the blast; Spock's death was balanced by the birth of a new planet from the Genesis explosion in the nebula; after a mournful eulogy and funeral, Spock's body was ejected into space for burial to orbit around the new planet and eventually land in the lush jungle; the film ended with reconciliation between David Marcus and father Kirk, and the rescue of the remainder of the marooned Reliant crew on Ceti Alpha V, as Kirk felt a vital sense of renewal ("Young. I feel young...!"). The second film of the original series. With some of the same characters from the previous film, with some additions. The second, third, and fourth films comprised a loose trilogy. Regarded as one of the best, most-critically acclaimed films in the entire series. No Academy Awards nominations. With a production budget of $11 million, and box-office gross receipts of $79 million (domestic) and $97 million (worldwide). At the time, it set the record at the box-office for the highest opening weekend. Great Scene(s): The battle in the Mutara Nebula between the Reliant and the Enterprise, the Genesis Effect explosion, and tearjerking moment of Spock's sacrificial death: "I have been, and always shall be, your friend" followed by Kirk's eulogy for his friend.